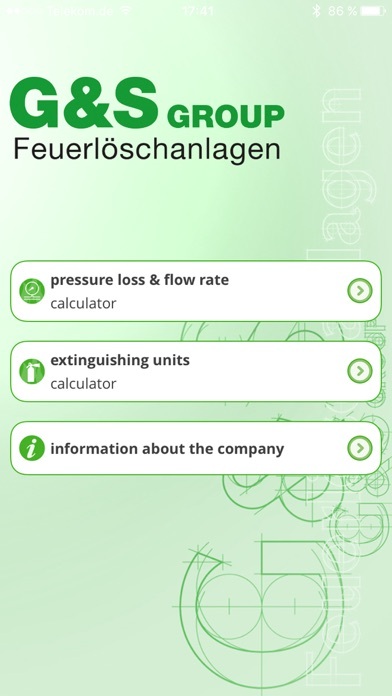 At the area of “pressure loss& flow rate” you may find different calculators and information for the estimated layout of a sprinkler system. 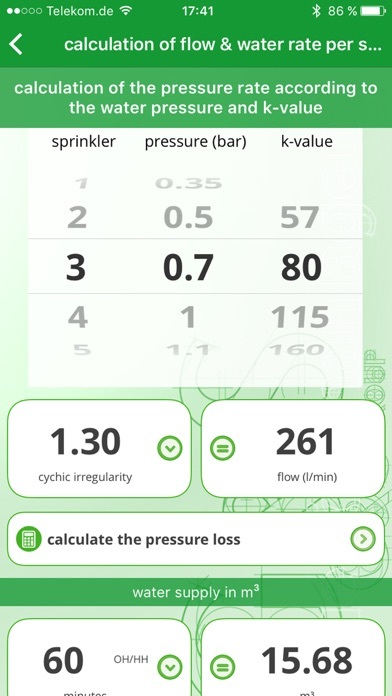 -The calculator “calculation of flow & water rate per effective area” allows you to calculate the flow rate on basis of the water application, the attendant effective area (depending on the risk) and the supposed cychic irregularity. With the next step you may calculate the used water supply via the operating time. 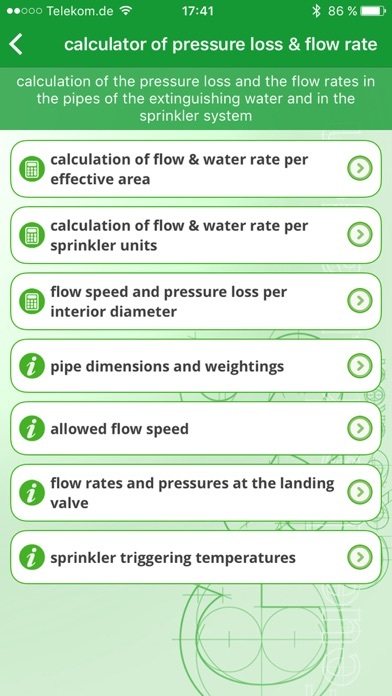 -The button “calculation of flow& water rate per sprinkler units” allows you to calculate the flow rate on basis of the preset number of sprinklers, the used minimum water pressure at the sprinkler, the k-value and the supposed cychic irregularity. With the next step you may calculate the used water supply via the operating time. 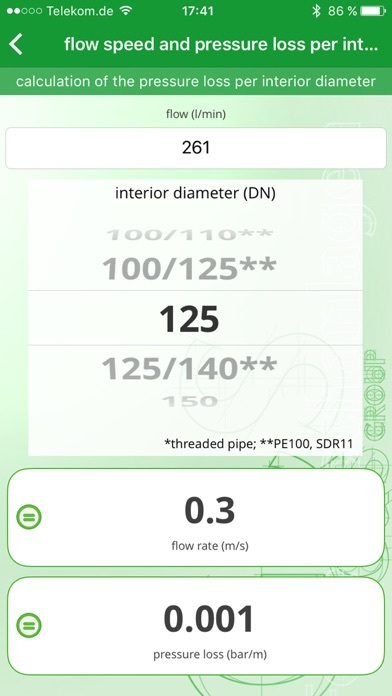 The calculator “flow speed and pressure loss per interior diameter” allows you to calculate the flow speed and the pressure loss in the different pipes on basis of the flow rate. 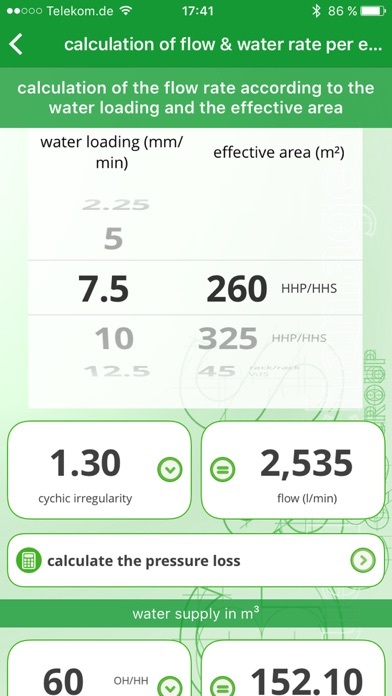 The value for the flow pressure may either manually enter or accept directly from the calculators “calculation of flow & water rate per effective area or “calculation of flow & water rate per sprinkler units”. Otherwise you may find in this area much useful information how to dimension a sprinkler system. In the area of “extinguishing units” you may calculate the used extinguishing areas after ASR A2.2 on basis of the base area and the fire hazard. Otherwise you may find in this area much usefull information for the assortment of the right extinguishers.